Grace is designed by Paolo Grasselli and is an irresistibly dainty design. It’s created by fusing different sizes of metal rings together so that empty circles clasp cushioned spheres, creating a frame of coloured and transparent ‘bubbles’. 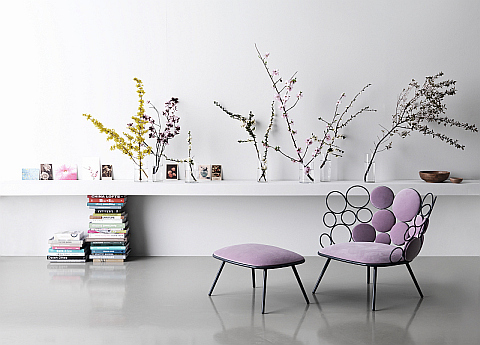 The frame and rings are made from lacquered iron, which can be finished in either white or grey, and Grace can also be used inside as well as out. 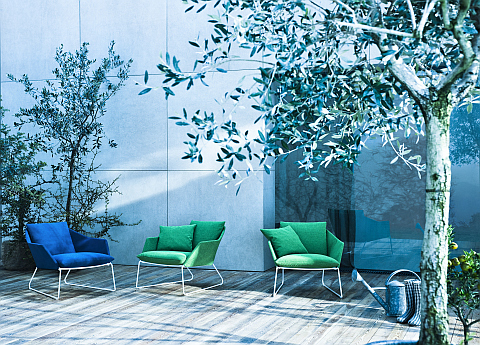 The beautifully vibrant colours of the New York garden armchairs, designed by Sergio Bicego for Saba Italia, are produced in water-proof quick-drying non-absorbent technical fabric (with an excellent performance in the Martindale test of up to 90,000 cycles – for those of you who like the full tech stuff!) which guarantees abrasion resistance as well as hygienic ‘breathability’. And there are 13 different outdoor fabrics to choose from, or you can supply your own. Incredibly comfortable (trust us – we sat for a long time at the recent Milan show on one of these!) the white-painted tubular metal frame is specifically treated for outdoor use. 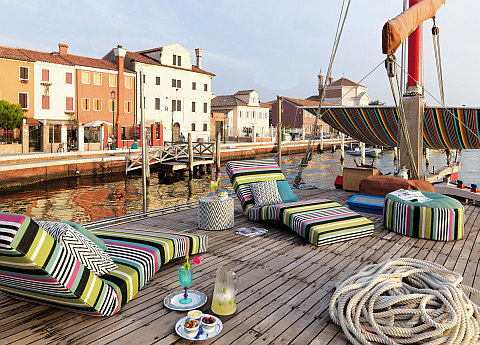 Missoni Home are lauded the world over for their beautiful fabrics and they’re now producing striking outdoor furniture too. As you’d expect from this award-winning fashion and accessories company their designs are eye-wateringly good and, of course, instantly recognisable. The Jalamar sunlounger will attract more than a few admiring glances around the pool. The covers are removable with a huge choice of Missoni fabrics to choose from. And for sun lovers, the Jalamar has a fully adjustable frame (due to its clever internal mechanism) allowing you to capture those rays from any angle. 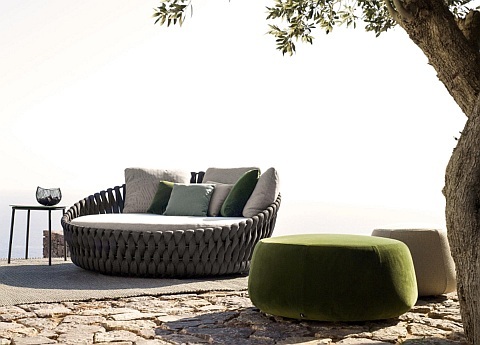 There are an incredible number of stunning outdoor fabrics to choose from this summer. During last year’s London Design Festival, we were joined by Melanie Bernard from the outdoor fabric company Sunbrella for a Q & A session about the latest trends in furniture and fabrics. Sunbrella began by producing fabrics for yacht sails – so they know a thing or two about all-weather material! They’re now international specialist in fabrics for garden furniture and work with all the leading companies in this area. For the most luxurious, sumptuous outdoor fabric, how about velvet (yes, you read that correctly – velvet!). Belgian specialists Tribù have used velvet for their Nomad garden poufs and they really caught our eye when we saw them at the last Milan show. One word: Stunning! And they come in seven delicious colours including marine blue, oyster, acqua and the moss colour seen above. So practical, pretty design-led garden furniture. Who needs sunshine when you can create your own! Check out all of our latest garden designs here. Previous PostPrevious From Hollywood glamour to industrial chic – brand new garden furniture!